One of the exhibits at the Worcester Art Museum chronicles the ’60s. The state’s second largest city calls itself “The Heart of the Commonwealth.” The term is less romantic than practical, since Worcester’s central location helped make it a transportation hub by the early 19th century. Its train station and other institutions recall the city’s glory years as a manufacturing powerhouse through the first half of the 20th century. But it’s a mistake to write off Worcester as all work and no play. There’s plenty to keep daytrippers busy. 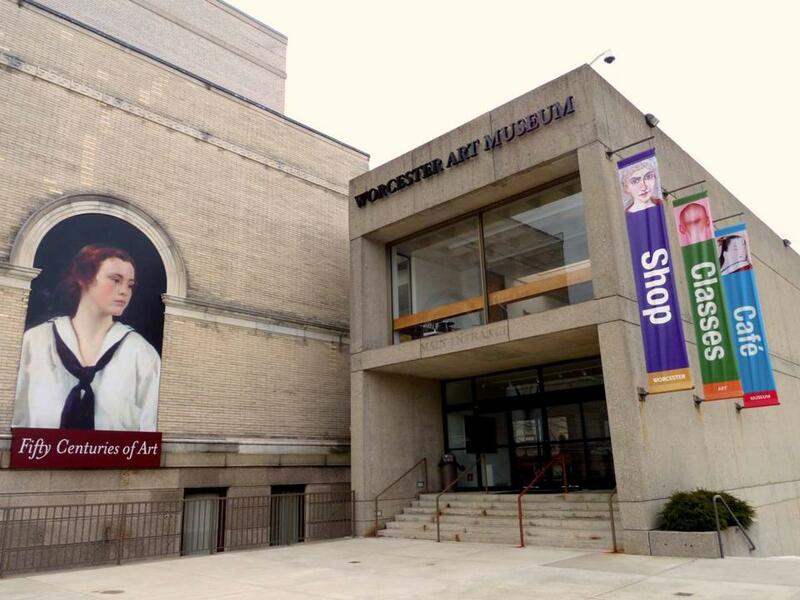 Late last year the MBTA increased the number of weekday commuter rail trips between Boston and Worcester and it’s easy to leave South Station in the morning and arrive in Worcester around the time that the museums open. If you’d like, you can even stay for dinner before heading home. (Choices, alas, narrow on weekends; see www.mbta.com) The MBTA also introduced some bilevel coaches on the route. Prize seats (especially for crossword puzzle aficionados or tablet toters using the on-board Wi-Fi) are those in the middle of each car that face each other across a small table. The ride takes about 90 minutes and never seems to pick up much speed as it stops in the suburbs along the way. Nevertheless, the line was on time 91 percent of the time in 2012, according to the MBTA’s records. My recent trip ran like clockwork, although train crew on the return journey only reluctantly opened extra cars to alleviate crowding. The best place to appreciate the city’s tradition of invention and innovation is at the Worcester Historical Museum (30 Elm St., 508-753-8278, www.worcesterhistory.org, adults $5, seniors and students $4), which traces Worcester-made products from adjustable wrenches, barbed wire, and ice skates to organs, corsets, and high-altitude space suits. Worcester also made an enduring contribution to popular culture when local commercial artist Harvey Ball created the smiley face button in 1963 for an employee morale-boosting campaign. A second-floor gallery tells the story and the small gift shop features the buttons, Christmas ornaments, and (for the truly enamored) $130 sterling silver charms. Worcester’s manufacturing glory days may be past, but the city’s grand architecture and distinctive neighborhoods remain. If you’re still in a historic frame of mind when you reach the Worcester Art Museum (55 Salisbury St., entrance on Lancaster Street, 508-799-4406, www.worcesterart.org, adults $14, seniors and college students $12, age 17 and under free), check out the temporary exhibition “Kennedy to Kent State: Images of a Generation,” which is up through June 9. Photographers documenting the turbulent era created such iconic images as the Beatles on “The Ed Sullivan Show,” Neil Armstrong stepping on the moon, and US athletes giving the “black power’’ salute at the Mexico City Olympics. The museum was incorporated in 1896 by a group of prominent citizens who wanted to bring refined culture to the predominantly industrial city. Bostonians often overlook the museum, but curators have a knack for mounting thoughtful exhibitions. The permanent collection, mostly arrayed in galleries around the light-filled Renaissance Court, covers everything from Roman floor mosaics to Andy Warhol soup cans. The cafe (soup, salads, sandwiches $5-$13) is a good place for lunch or for a cup of tea and a flourless chocolate caramel crunch cake for an afternoon pick-me-up. You can also dine in a piece of history. Worcester was once a center of diner car manufacturing and several are still operating, including the 24-hour Boulevard Diner (155 Shrewsbury St., 508-791-4535, plates $2.25-$11.95) built in 1936. An illuminated clock and extensive neon give the exterior a bit of glam, but inside it’s all business with a long counter and stool seating, wooden booths, and friendly waitresses who serve up diner classics. I paid $20 round trip. If you don’t have time to stop at the ticket windows at South Station, you can make your purchase on board, but a $3 surcharge will be added. If you’re carrying a smart phone, you can beat the surcharge by buying a ticket with the mTicket app available from the iPhone store (for iPhone) or Google Play (for Android). Patricia Harris can be reached at harris.lyon@verizon.net.